It doesn’t take a genius to work out how Newcastle-upon-Tyne got its name. But what about its many suburbs? These were all originally settlements in their own right but have long-since been swallowed up by the sprawling city. Jesmond – An interesting one, this. Seems to mean ‘Ouse mouth’ – the Ouse being the river that runs through the area and whose confluence with the Tyne is a little to the south. Both elements (‘Ouse’ and ‘mouth’) have been corrupted to ‘Jes’ and ‘mond’ under French/Norman influence. Or so the academics tell us. In the days when Coxlodge was a settlement consisting of a handful of terraces around a couple of collieries, a certain T.W.Glidden was born there – a man who would go on to find footballing fame, but at some distant from his native parish. Thomas William Glidden was born on 20th July 1902 and began kicking a football in earnest for local outfit Colliery Old Boys, before moving on to Boldon Villa and Sunderland West End. Moving up to the professional game, he spent his entire career thereafter in the Midlands at West Bromwich Albion during 1922-36. When he joined Albion in 1922, they were a force to be reckoned with in the game – having been crowned English champions as recently as 1920. It was, therefore, no mean feat breaking into the team, where he played as a forward at outside-right for a total of 445 league games, scoring 135 goals. He helped the club to a 2nd place finish in 1925, before they were relegated in 1927. They languished in the Second Division for four seasons, gaining promotion in 1931 with Glidden as captain. However, 1931 also brought West Brom’s first FA Cup success for almost four decades – and Glidden had the honour of lifting the trophy as skipper as they beat local rivals Birmingham City at Wembley 2-1 (incidentally, Glidden had scored the only goal in the semi-final win over Everton). The cup victory on 25th April was followed a week later with confirmation of their promotion back to the First Division – the first (and only) time such a ‘double’ had been achieved in English football. In the crucial final league match Glidden both scored and made a goal in a 3-2 win at Charlton. 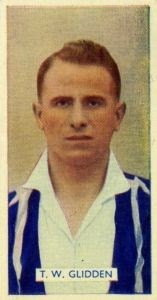 Glidden continued playing for West Brom until the close of the 1935-36 season – all in the First Division – appearing in a second FA Cup Final in 1935 (again as captain) when Albion lost to Sheffield Wednesday. He is remembered as one of the club’s finest captains, but never quite gained an England international cap. He died in West Bromwich in July 1974, ten days short of his 72nd birthday. What is so often overlooked in the history of coalmining is the great amount of time, risk and expense that went into the sinking of speculative new pits. There was never any guarantee of success, and such was the sense of relief and celebration that followed a successful ‘winning’ of a new colliery that quite often a subterranean ball would be held to mark the occasion. With a refreshing disregard for modern-day health and safety concerns, these extraordinary events represent a fascinating cross-over between the classes of the day, when the well-to-do would descend into the bowels of the earth and mix with the pitmen and their families. The ball-room was situated at a depth of nearly 1,100 feet below the earth’s surface, and was in the shape of the letter L, the width being fifteen feet, the base twenty-two feet, and the perpendicular height forty-eight feet. Seats were placed round the sides of the ball-room, the floor was dried and flagged, and the whole place brilliantly illuminated with candles and lamps. The company began to assemble and descend in appropriate dresses about half-past nine in the morning, and continued to arrive till one in the afternoon. The men engaged in the work, their wives and daughters and sweethearts, several neighbours with their wives, the proprietors and agents with their wives, and sundry friends of both sexes who had courage to avail themselves of the privilege; all these gradually found their way to the bottom of the shaft. Immediately on their arrival there they proceeded to the extremity of the drift, to the face of the coal, where each person hewed a piece of coal as a memento of the visit, and then returned to the ball-room. As soon as a sufficient number of guests had assembled dancing commenced, and was continued without intermission till three o’clock in the afternoon. No distinction was made among the guests, and born and bred ladies joined in a general dance with born and bred pitmen’s daughters. All now returned in safety, and in nice, clean, and well-lined baskets, to the upper regions, delighted with the manner in which they had spent the day. It was estimated that between two and three hundred persons were present, and nearly one-half of them were females. Gosforth Colliery was worked for a little over half a century, until it was abandoned in 1884. Real tennis, the ancient forerunner of our more familiar racket sports, has been around since at least as long ago as the sixteenth century. It is now very much a niche, or specialist, sport, as is evidenced by the distinct lack of courts worldwide. Globally, there are less than fifty, with the UK being home to more than half of these. One of the more noteworthy venues is that at Jesmond, to the north of Newcastle. It was built in 1894 as a private court for Sir Andrew Noble, who owned nearby Jesmond Dene House. Noble, a Scot, was a leading light at the famous Armstrong munitions works – and was a handy player himself (despite suffering occasionally from gout!). The architect responsible was local chap F.W.Rich. 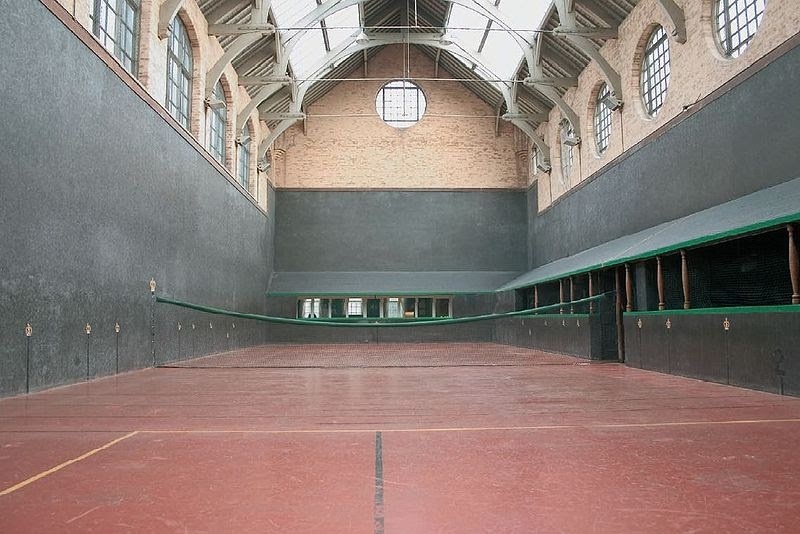 The suitably-named Jesmond Dene Real Tennis Club now occupies and runs the curious set-up, though it enjoyed a chequered twentieth century existence. During World War I airships were said to have been constructed there; and, following a brief reversion to ‘family’ use after hostilities, the building moved out of private ownership and into the care of Newcastle Council in 1931. The formation of a tennis club on the site the following year helped maintain the historic links, but Badminton ran the roost at the venue for many years following WWII. Happily, though, the building eventually reverted to its proper ‘real tennis’ use in 1981. It is now, quite rightly, a listed building. More extensive historical info here. © Copyright Ken Brown and licensed for reuse under this Creative Commons Licence. The former W.D. & H.O. Wills Tobacco Factory on the Coast Road, Newcastle, holds a strange fascination with local folk. The massive post-war industrial building, half classical, half Art Deco, is a curious affair, and has even achieved listed status. It survives as a residential complex. Designed along American lines by Cecil Hockin (architect to the Imperial Tobacco Co.), the fanciful construction was dreamt up in the late 1930s. Built during 1946-50, it consists of red brick and Portland stone erected around a steel frame. What you see today is essentially the factory’s office complex, with its lofty central tower and robust entrance block. The elegant frontage formed only part of an originally greater whole – the factory itself to the rear was demolished in 1995, some nine years after the plant’s closure as an industrial concern. 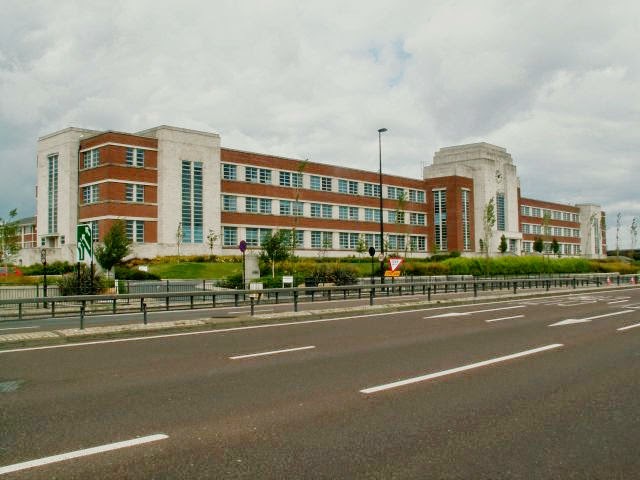 Eventually, in the late 1990s, the remaining office block was redeveloped by architects Wildblood Macdonald for builders George Wimpey and reopened as one-, two- and three-bedroomed apartments. And thus a grand (and modern-ish) North-East landmark was saved.